"Fancy going camping? Lake Garda camping offers so much for those who love the outdoors!" 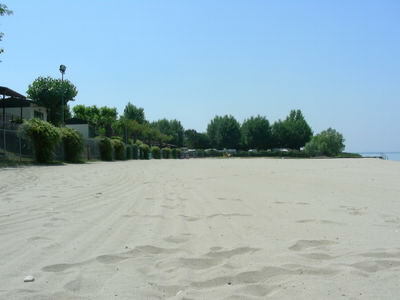 There are so many fantastic places for Lake Garda camping. For one thing, the lovely weather means you can enjoy loads of sun and mild nights and where else can you get scenery like this? 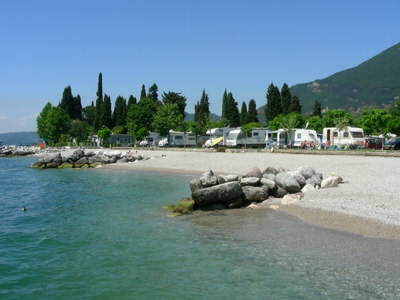 There are a large range of campsites around Lake Garda and most are either right by the lake or very close to it. There are more camp sites on the south half of the lake as the terrain lends itself better to these types of facilities. Some campsites are smaller with limited facilities but most are quite large with their own swimming pools, shops, restaurant and bars, washing facilities etc. You can choose between using a tent, a caravan, motorhome or renting a static unit on the campsite. Some offer a high level of comfort and we even found static units with air conditioning and decks, for those who want the experience of camping but the luxury of the good life. In my view one of the most appealing aspects of camping here is the wonderful surroundings! Most campsites have great lake views and waking up the gentle lapping of the small waves from the odd boat passing is very tranquil. Some sites have their own private beaches, and if you can get a spot right behind the beach then this is the way to go. Also, the very lush vegetation and great shade the numerous trees offer makes for a great environment for Lake Garda camping. We have visited and researched a lot of campsites around Lake Garda. We have found that Eurocamp operate some of the biggest and best sites in the area. They also have tend to run quite a few sales and promotions through out the year. So if you are considering going camping here then we would recommend you try them out. If you know what area you would like to camp in why not take a look at all the campsites they have to offer. Most campsites offer a range of places you can stay, from a plot to pitch a tent to a full-blown static unit. If you don't want to rough it then many campsites offer air conditioned static units, which is great for the hot summers. Also for those wanting to drive to Lake Garda, this option saves a lot of space in the car, that all your tent and camping gear takes up. People who enjoy touring can use space to house their caravans or motorhomes. If you are using a tent then there is the option of bringing your own or, in some campsites, renting tents already in place. The space and surroundings vary depending on the individual campsites. In short, you get what you pay for, as with most things in life. However, in terms of accommodation, camping is by far the cheapest way to stay at Lake Garda and is a great family experience (we love it). Most campsites are a good size and have a range of facilities on offer. While you will usually find the basic washing facilities, etc. at all sites, many also provide their own on-site facilities and are like a camping village. Basically you have everything you need on the larger sites, so you never have to go off the campsite should you wish not to. There are often shops, restaurants and bars, a choice of swimming pools, internet access etc. The larger sites also often have daytime entertainment programs for the kids and and nightime entertainment for the adults. Lake Garda Camping - Take your own, or hire a tent on the campsite? A lot of people will take their own tents, when camping at Lake Garda, but not all. Some campsite operators offer the option of hiring their tents, which are already put up and ready to use. The upside of this is that it is easy and hassle free, just turn up and move in. However this will cost considerably more than bringing your own tent and paying for just a pitch. Even if you don't already own a tent and buy a new one, you will probably save money after 2 or 3 weeks camping (compared to hiring a tent each time). If you are going to buy, it makes sense to buy a big enough tent, as you can never have too much space! Even if you are only a family of 4, I would recommend getting a big tent (at least a 6 man) leaving yourself plenty of living, sleeping and storage space. Tents are relatively inexpensive these days and can be used time and time again. So if you are thinking of camping again in the future, it probably makes sense to buy one. Which is the best campsite on Lake Garda? Have you camped at Lake Garda? Which campsite is the best here? Why not share your story about it and you are highly likely to get your own spot on our website! Your story could well feature on a dedicated web page and may even get in our newsletter too! How good would it feel to show your friends and family your own Lake Garda story on a well respected Lake Garda site! We love pictures as well, so feel free to send us your best shots and there will be no mistaking you then! Do I need to book a Lake Garda campsite in July? Click here to go from Lake Garda camping to the home page.